Are you ready to “Stay and Play” well The Three Bear Lodge is the place for you. 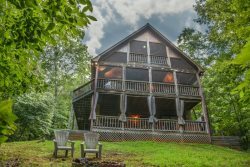 From the moment you drive up, this beautiful cabin offering an outdoor Fire-Pit, Cable TV, Free WiFi, Game Room with Air Hockey, Pool Table and of course a Hot Tub on one of the screened porches you will know you’ve found the one. Walk into an open living, dining area with vaulted ceilings, wood beams, stone-gas log fireplace and a fully equipped kitchen. Step out onto the large screened in porch to plenty of seating, a porch swing and a gas grill. There are 3 Bedrooms in the home, 1 Queen on the main level, 1 Queen upstairs and on the terrace level there are two sets of twin-bunk beds. Three bathrooms, one on each level of the home to comfortably accommodate 8 guests. The Upstairs bedroom has a private screened in balcony to sip your morning coffee and the main level bedroom opens up to the screened porch. Step downstairs into the game room for some friendly competition of pool or air hockey then bask in the Hot Tub just outside on the screened porch. Don’t miss out on the many unique activities and outdoor experiences North Georgia has to offer. Meander the streets of Blue Ridge where you will find one of a kind shops and eateries. Take a ride on the Blue Ridge Scenic Railroad, Hike the Appalachian Trail, Visit a waterfall or swinging bridge, Tube, Kayak, Paddle Board or White Water Raft the Toccoa or Ocoee River’s. Go boating on Lake Blue Ridge or step back in time and watch a first run movie at the famous Swan Drive-In Theater. And of course Mercier Orchards is a must. There is always a festival or event happening here in the mountains. The cabin was wonderful and in a great location to the city. It was very clean and beautifully decorated. We had a great time. The cabin was clean, spacious and comfortable. Everything we needed was available. The kitchen was well-equipped so we could make some food here. Great place to relax and getaway. We would love to come back!! Great space and plenty of entertainment for kids. They had the basement which was like an apartment for them with pool table, air hockey and hot tub. Beautiful and clean cabin. Incredible view from the porch and couch to watch the sun rise. Large loft with 2nd 1/2 bath is a nice plus. True mountain cabin experience! Gas fireplace is great and easy to use!! Cindy and the team of Mountain Laurel Cabin--- Rentals were just awesome. we evacuated for Florence, and arrived at dark to a property we rented online... which ended up being way too small for us. Called and spoke to Cindy at 8pm, who said we're limited to hey...no bc of the online rental, we gave no control or access to that, but then offered to contact her manager and call me back. Result: they found an alternative cabin i'f it was suitable and acceptable to load back up now. The new location was bigger, better, and cheaper! It was a true blessing to our family. I really appreciated all that they did to support our needs and especially at that time of night. thanks! we will definitely save their contact info for future use. they are amazing.